Do you want a knife sharpener that sharpens every knife under the sun? Imagine, if you dare, a perfect world, where you spend your days being fanned by supermodels and drinking mojitos on a deserted beach. If such a scenario existed–if you could have everything you heart desired–you’d also likely have a treasure trove of blades. You’d own pocket knives, boot knives, Bowie knives, knives with tanto blades, serrated knives, gut hook knives, kitchen knives, filet knives and every other knife under the sun. And how would you sharpen all of those blades? Well, a magical knife sharpener capable of sharpening every knife under the sun, of course! But, wait, you don’t have to be enveloped in a day dream to own the world’s most versatile knife sharpener; all you have to do is buy it. 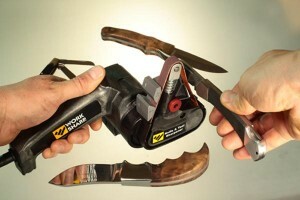 Introducing the Work Sharp Knife and Tool Sharpener, the first knife sharpener designed to sharpen every knife you own. The Knife & Tool Sharpener uses precision angle sharpening guides to ensure that you get the proper angle every time you sharpen. This bad boy packs two primary guides,: a 50° guide for hunting and outdoor knives (25° per bevel) and a 40° guide for thinner blades and kitchen knives (20° per bevel). What does that mean? It means your blades will be sharp enough to shave with (don’t try it). In addition, this badass tool also sharpens other common work tools like scissors, axes and hatchets, mower blades, garden shears, shovels, and most any tool with a blade. Don’t believe me? Check out the video below.